The Microsoft SharePoint TeamSite can be selected here. The name of the folder is shown here. The type of the folder is shown here. The URL to the folder in the web is shown here. Subfolders will be included in the search with this option. You can search for a specific subfolder here. 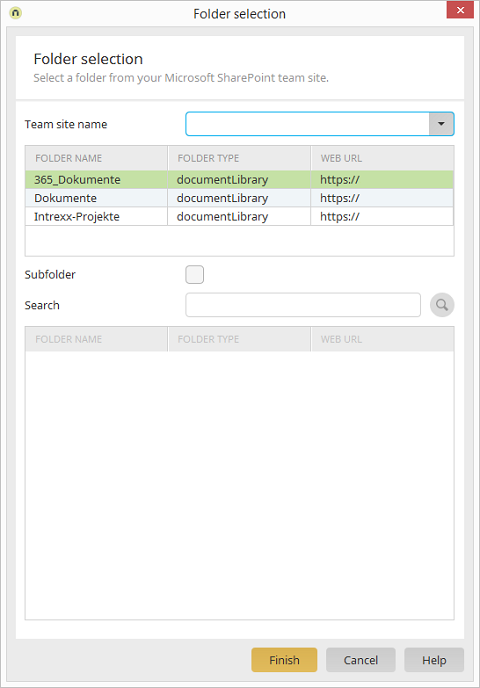 Filters the folder list based on the search term. Enter * to list all folders. Entries with characters that are not permitted will be shown in red; the search button is deactivated in this case.